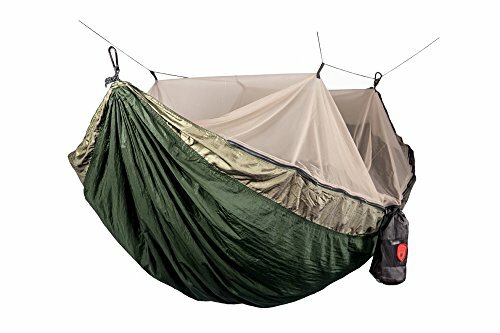 Best Hammocks for Camping and Outdoors | #1 Ranked and Reviewed. The Best Camping Hammocks Rated and Reviewed. Searching for the best camping hammocks for sleeping, relaxing and ultimate comfort? best hammocks: reviewed, rated, and tested by sleeping experts. For outdoor hammock, camping adventurers, hanging your hammock beats tent camping any time. Hammocks, they say, offer better sleep, comfort, easier set-up, and they’re often lighter than tents. You’ll never have to sleep on hard ground again! Bottom line, hammock camping is a great alternative, and more and more adventurists are making the switch. Are you looking for your first hammock camping rig? Or maybe you’re looking to upgrade your existing set-up? Here’s some good news. The best camping hammocks push the boundaries of innovation. Today’s backpacking hammocks are better insulated, lighter, and more comfortable than ever. Best Open Hammocks – Sometimes called parachutes, open hammocks don’t include an integrated bug bag. It’s just a banana-shaped hammock available with minimal insulation. These are great for overnights (if you insulate properly), or for just lounging at camp. Best Hammock Tents – Hammock tents are the total package. 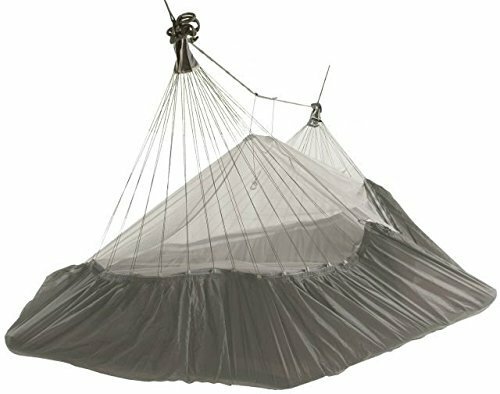 These hammocks include integrated mosquito nets and a rain fly, and they resemble small one- or two-person tents that hang in the air. Hammock tents are perfect for backpacking. Best Bridge Hammocks – Bridge hammocks offer a counterpoint to traditional open rigs. They’re designed to pull taut, with a flat sleeping surface. These are great for lounging or backpacking, and side sleepers love them. Now you’ve got a lay of the land. So, what are the best camping hammocks of the year? In order to really know the best, you have to understand the different kinds of hammocks. Did you know there are hammock styles like rope, quilted hammocks, Mayan hammocks, Brazilian and Nicaraguan? 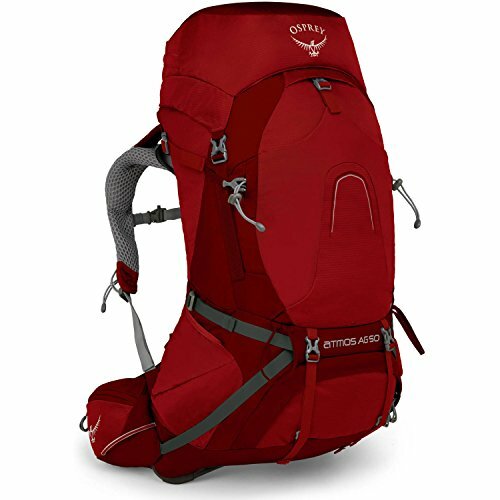 With so many brands ranging from ENO, Everest, Hennessy, Kammok, Hummingbird, Grand Trunk, to Wise Owl, it’s tough to know which is the best. The good news: we have classified and ranked our favorite hammocks by category - from open hammocks, hammock tents to bridge hammocks, we them all ready for you to see. Open hammocks are super lightweight, and they’re perfect for just about any adventure. Plus, with the right accessories, you can deck yours out for just about any weather conditions. Eagles Nest Outfitters launched the hammock camping revolution back in 1999, and since then, they’ve been putting out some of the best backpacking hammocks on the market. The DoubleNest is its flagship product. And there are a lot of reasons this is one of the industry’s favorites. For one, the DoubleNest is super durable. It’s made from 70D Nylon, a tightly woven and breathable fabric that stands up to the demands of hikers. It has a capacity of 400 pounds, and provides plenty of room for one or two (though be prepared to snuggle). What’s more: the DoubleNest outdoor hammock packs down into a built-in stuff sack to the size of a grapefruit. At just over one pound, it’s the perfect shelter for backcountry overnights. Pros: The lounging is super comfortable. You’ll get an incredible night of sleep, especially if you’re flying solo. The set up is easy, and the built-in stuff sack is a nice touch. Cons: For two hikers, the DoubleNest is definitely cozy. You might want your own, if you like space, or you could pick up a SingleNest, the smaller version. Also, this is a parachute-style rig; it doesn’t offer much in terms of insulation. In cold weather, bring along a sleeping pad or under quilt. Final Verdict: The DoubleNest is an industry-best that earns high marks for its comfort and durability. 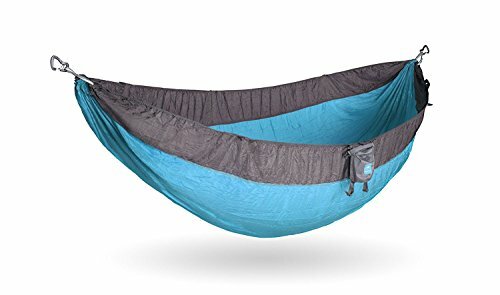 This is an amazing outdoor hammock for sleeping and general comfort. Well done! 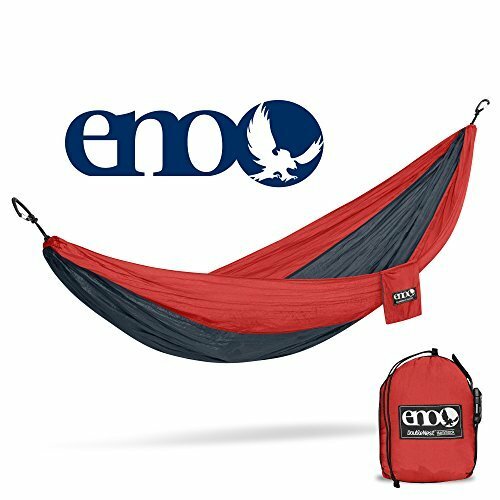 >> Learn How to Buy Your Eagles Nest Sleeping Hammock! Most parachute camping hammocks feature a three-panel design. That provides tons of stretch – almost too much. The result: After a few nights out on the trail, the hammock tends to sag a bit. The Traverse is designed to prevent sagging. Featuring a two-panel design with a diagonal seamless hem, the Traverse provides improved stability and support. This hammock doesn’t have as pronounced a banana shape as others; it’s closer to a lie-flat than others. Plus, it includes a solid suspension system: 11-foot tree straps with 18 daisy chains and aluminum carabiners. That’s a huge plus. Most require you to purchase the suspension separately. Pros: The design provides more support than traditional open parachutes. That’s great if you like a sleeping surface without tons of give. The included suspension system is also really great. No need for upgrading. Cons: There isn’t much insulation. You’ll need to invest in an under quilt or one of Klymit’s hammock sleeping pads. Plus, although it’s more supportive, there really isn’t much stretch. It can take some time to get that worn-in feeling. Final Verdict: The Traverse’s unique design provides plenty of support and stability. No need to worry about rips or tears. This is a hammock that can also stand the test of time… including the weather and toughest conditions outdoors. 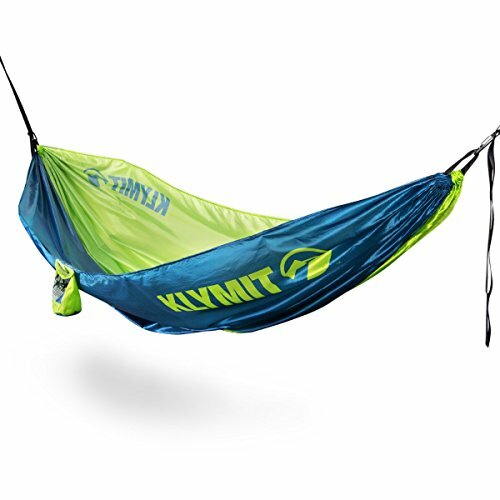 >> Learn how to buy the Klymit Traverse Double Hammock! The Roo looks like a traditional parachute open hammock. But there’s a bit more to it than meets the eye. For starters, the Roo is made from Kammok’s patented LunarWave material. It’s stronger and lighter than standard parachute nylon, and it’s softer to the touch. The result: The Roo feels sturdier than a lot of double hammocks on the market. Plus, the Roo hammock is massive. It folds out into a 10-by-6-foot sleeping space, about the size of a queen bed, and that’s more than enough room for two. At 23 ounces, the Roo is also one of the lightest double hammocks on the market. This is a great all-around hammock that will last (and it’s protected by a Lifetime Warranty). Pros: The Roo is huge. You’ll feel like you’re wrapped up. And it’s super sturdy. Not many parachute hammocks have a 500-pound capacity. Cons: This hammock is so big that it’s not great for one person. You’ll feel like you’re swimming in fabric. Plus, a ridgeline isn’t included, which can limit its sag. You can fit your own though. Final Verdict: The Roo is one of the most spacious two-person hammocks on the market. Perfect for snuggling on the trail. >> Learn how to buy the Kammok Roo for Your Camping Outdoors! If you’re looking a rugged, backcountry hammock, consider a hammock tent. This type of hammock is designed to protect from the elements, and they tend to have better insulation. Want a little bit of protection from biting critters? This is the hammock you’re looking for. The Skeeter Beeter is designed to keep out bugs. 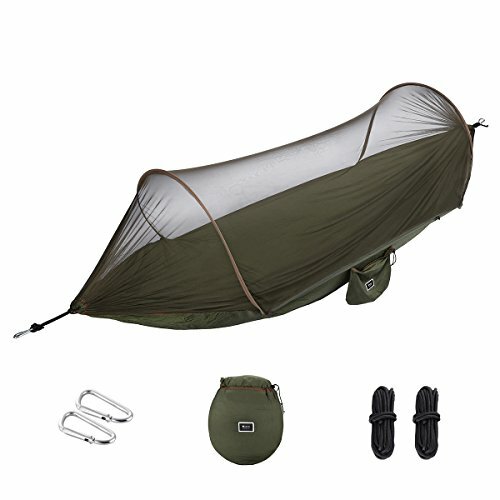 It has a heavy-duty, built-in mosquito net – an accessory you have to buy for open-style rigs – and that makes it super versatile. 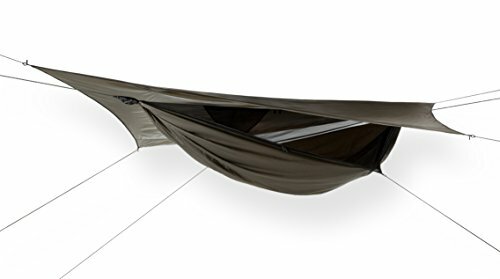 Beyond the netting though, which is made from heavy-duty nylon and designed to keep out no-see-ums and mosquitos, the Skeeter Beeter is super spacious as one of the best all-around hammocks money can buy. It’s about 10-feet in length, and fairly wide. That leaves plenty of room for two to cuddle up comfortably. Pros: The Skeeter Beeter is massive. The sleeping area is about five feet wide and ten feet in length. It’s practically a mansion! Plus, the hammock is durable, thanks to the 100% parachute nylon fabric – especially the mosquito net. This isn’t some flimsy netting that you’ll rip through in your sleep. Cons: The included ropes aren’t the most practical; you should upgrade to longer straps. Plus, the sleep position is more like a traditional hammock. There’s a bit of slope to it. If you want a flatter position, you might like a bridge-style hammock. Final Verdict: The Skeeter Beeter keeps the bugs out – and that’s reason enough to consider it – but it’s also spacious and super comfortable. This hammock is an awesome addition to any camping and outdoors adventure! >> Learn how to buy the Grand Trunk Skeeter Beeter! Hennessy has been designing hammocks for 40+ years. And the Expedition Series is proof of all that hard work. This hammock kit – it includes a built-in bug bag, a rain fly, straps and of course, the hammock – is the ultimate survival shelter. It’s durable, built from densely woven nylon, and designed for easy set up. Plus, it’s super user friendly. The Classic model has a patented bottom-entry system, which makes getting in and out child’s play. The webbing straps are included (a big plus), and Hennessey’s patented asymmetrical shape makes it easier to get comfortable. If you’re looking for a lightweight shelter, this one is great. Pros: This is a total kit – no need to buy accessories like a bug bag. Bottom entry is a nice touch. It’s one of the easiest to get in and out of. (But a side-zipper entry model is available, if you prefer it.) Plus, the webbing straps are included. For most others, you have to buy those separately. Cons: The Expedition Series is designed for people 6 feet tall or shorter. But it can be a bit snug. If you need more space, upgrade to the Explorer hammock from Hennessey. Another pitfall: The rain tarp has an interesting shape that, without perfect set-up, can leave you exposed. Upgrading to a larger tarp might be necessary. Final Verdict: The Expedition Series is the total package. Buy one and you’ve got a shelter for just about any adventure. Straps, bug bag and rain fly included! This hammock for the outdoors will make you smile: it’s comfortable, lightweight, and is durable in extreme weather conditions. >> Learn how to buy your Hennessy Hammock Explorer! #3: Clark Outdoor “NX-270” Hammock | Awesome for Cold Weather! 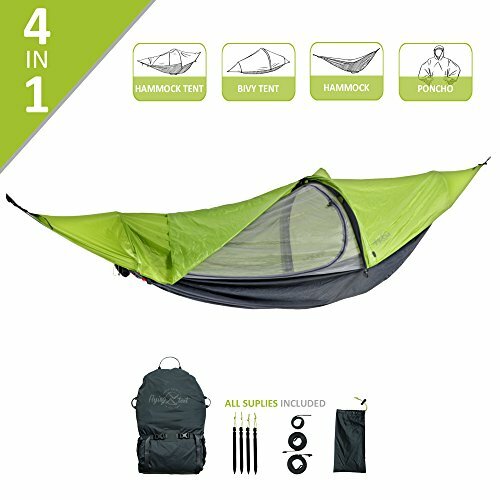 The NX-270 is almost more of a tent than a hammock. This is a complete survival shelter, and it’s rated for every season. In fact, unless you are camping in the cold conditions, you won’t likely need an under quilt. That’s due in part to the NX-270’s WeatherShield system. That’s a heavy-duty nylon layer that zips over the bug netting. This provides great insulation, much like what you could expect from a tent. Additionally, the NX-270 includes pockets underneath the sleeping area, where you can stash gear and/or extra clothing. This adds another insulation layer. The hammock also features two tent poles that give this an almost bivy-like design, albeit it’s a bit more spacious. Bottom line, if you camp in snow, this survival shelter provides incredible comfort AND insulation. Pros: The NX-270’s design keeps you warmer than a normal hammock – in fact, you can leave the under quilt at home on most hikes. Plus, the double-floor storage is convenient. Cons: The NX-270 isn’t super compact. It stuffs down to about the size of coffee can; that’s a problem when space is at a premium. Also, the NX-270 says it’s a four-season shelter. The problem: You’ll still need an under quilt for winter camping. Final Verdict: The NX-270 is built for four seasons, and it delivers. It’s one of the best cold-weather camping hammocks on the market. >> Learn how to buy this cold-weather Hammock! The All-in-One isn’t just a hammock tent. It has four uses: you can use it as a bivy sack, a hammock tent, an open hammock, and even a rain jacket. How’s that for versatility? Beyond that, the All-in-One also is designed for convenient set-up. It utilizes pop-up tent technology, to be fully assembled in about 10 seconds. 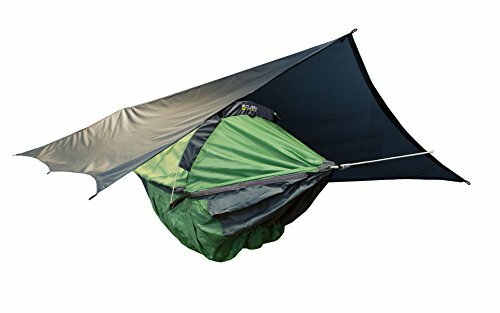 Plus, flying tent says the All-in-One is fully waterproof, thanks to an integrated rainfly, and it’s fitted with super-fine mesh to keep the bugs out. The poncho is another great benefit. It’s a full-body poncho that you can adjust for height. Pros: This is a great multi-use piece of gear. It’s a comfortable bivy tent and compact hammock tent, or a hammock or poncho. The pop-up technology makes set-up a breeze. It goes up in seconds. And a backpack is included for carrying. Cons: It’s expensive. But considering all of its various uses, you’re getting a lot. The hammock tent is fairly small; it does feel more like a hanging bivy sack. That can give you that dreaded coffin-like feel. It has a rather large footprint too. Not the best for backpacking. Final Verdict: The flying tent All-in-One is novel for its four uses. A great investment if you want the multi-functionality. Bridge Hammocks: designed to have flat, head-to-foot surface area. Typically with durable, lightweight, strong fabric material. Excellent hammock especially for side sleepers! #1: Exped “Ergo” | Bridge Hammock - Awesome Hammock! The Ergo utilizes an innovative design that gives you true horizontal sleep. Say goodbye to the banana shape! Rather than guylines at the head and feet, the Ergo features fan cords along the sides. The result is a hammock that hangs perpendicular to the trees and that has a mostly flat sleeping area. Beyond the cool design, the Ergo bridge hammock also features a double-floor. Beneath the sleep area you have pockets, which can hold a sleep mat or quilt on colder evenings, or your gear in warmer weather. The Ergo also has a mosquito-proof mesh roof, which stows nicely into a built-in stuff sack. Pros: You have more options for placement. Because the ropes are on the sides, you don’t need nearly as much clearance between trees. Another great feature: The double-floor allows for convenient stowing of gear. Cons: The Ergo is a bit small, especially for taller people. Exped says it’s ideal for people up to 6’5”, but that’s a bit of an exaggeration. You might want something more spacious if you’re 6’ or taller. Final Verdict: The Ergo has a unique design that provides comfortable, horizontal sleep (and easier set-up). This hammock offers a totally cool set-up for all sizes of people and adventurers. >> Learn How to Get Your Exped Ergo Hammock Today! The Lawson hammock has won a number of awards. Backpacker named it a #1 camping hammock, and it’s one of the sleekest bridge-style hammocks on the market. Here’s what’s great about the Blue Ridge: This hammock is easy to set up. It uses dual fanned cables at the head and toe, which give it even spread and a perfect horizontal shape. You can put this up in minutes. If you’re exhausted after a day on the trail, you can set it up as a ground tent as well. The hammock uses spreader bars to keep the floor flat, and there are arch bars to give it a nice half-dome shape. The interior is super spacious as well. The floor measures 7.5-by-3.5 feet, plenty of room to spread out. Pros: Wow! This hammock has got some room! Plus, it’s a true lie-flat hammock, which is perfect for side sleepers. Cons: With fly and poles, this hammock weighs nearly 5 pounds. That’s a bit heavy for backpacking. Plus, the stability can be a problem. The hammock can flip, which can be abated with some additional straps. And take your time getting in and out. Final Verdict: The Blue Ridge is one of the best bridge-style hammocks. This hammock is a must-own for side sleepers. >> Buy Your Blue Ridge bridge-style hammock, especially if you are a side-sleeper! OK, so the Flite Plus might not be a hammock. Tentstile calls it a tree tent, but it shares enough commonalities with a bridge hammock to be included here. 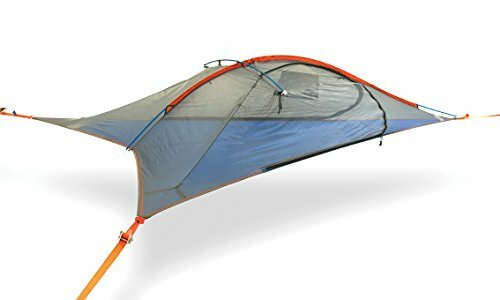 The Flite Plus is a triangular hanging tent. It floats off the ground, and features a more traditional tent shape. Overall, it has 40+ square feet of floor space. That’s plenty for two. What makes this like a bridge hammock? Well, it sits completely flat, and an under strap gives good stability to the sleeping floor. And like most camping hammocks, the floor isn’t well insulated. Even on relatively warm nights, you’ll lose heat through the floor, a problem an under quilt can solve. Pros: The comfort you’ll get from this tent is undeniable. The best sleep you’ll ever get outdoors. Plus, it’s spacious, with plenty of room for two. Cons: Set-up is a bit intensive. It takes 10 minutes to set up. After a long day, you might want something more simplistic to assemble. Plus, the insulation could be better. Bring an under quilt or air mattress with you. Final Verdict: The Flite Plus is expensive, but you’ll be buying one of the most comfortable hammock tents on the market. As an added bonus, we can speak from experience when we say these hammocks are some of the longest lasting and strongest quality on the market! >> Learn how to get your Tentstile Flite Plus Hammock! No matter the type of hammock you buy, there are a few accessories you’ll need to make your shelter complete. But with the right accessories you can transform any hammock into a 3- or 4-season shelter. Under quilt. Hammocks leave you suspended in the air, and that allows cool breezes to envelope the shelter. In warm weather, you’ll be comfortable. But when the temperature drops, you lose a lot of heat through the hammock’s bottom. By adding an “under quilt,” you can solve that problem. Under quilts are heavy-duty sleeping-bag-like insulators that hang below the hammock. Because they hang outside the hammock, the insulation can’t be tamped down when you lay on it, which maximizes its insulating value. The result: you stay warmer even in cool conditions. Ridgeline. Ridgelines connect the head and toe of the hammock, and they serve to give your hammock the perfect pitch. Without a ridgeline, the hammock stretches and goes taut, so you don’t get that comfortable hang. A ridgeline keeps the hammock in a reliable hanging position. Rain Fly. Just like a tent, you’ll need a rain fly for your hammock. Some hammocks are sold with their own rain flies. Sometimes they’re integrated into the design, but most often, they hang on their own line above the hammock. Ropes for Hammocks – This is the classic hammock support and they’re often included with many hammocks on the market. The problem is that ropes tend to put more stress on trees, especially when they’re not properly installed, and they do require knot-tying knowledge. 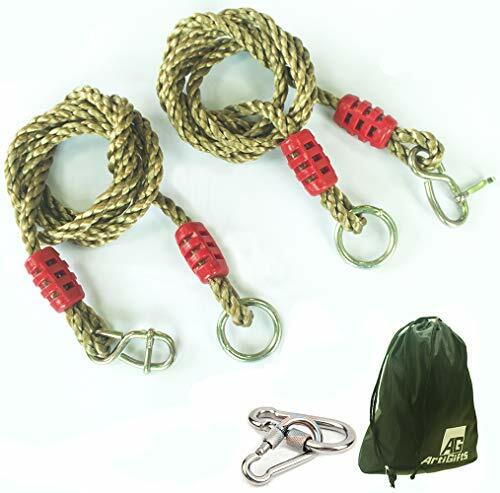 Tree Straps – Straps are typically made from heavy-duty webbing, and they’re flat and wide. These wrap around the tree, and then hook to the corners of the hammock. Tree straps tend to be much easier to install, and they’re typically sturdier. There are a lot of different strap styles too. Daisy chains are one of the most popular. Beyond these two, there are numerous other hammock suspension options. Choosing suspension usually depends on your options. For example, backpackers tend to focus on weight and stability. Bug Bag for Your Hammock. If your hammock doesn’t have a built-in mosquito net, you might invest in one. A bug bag is a large fine-mesh netting that zips around your hammock. These systems typically hang from the ridgeline, and do a great job of keeping the bugs out. Top quilt. A top quilt is essentially the top half of a sleeping bag, e.g. a heavy blanket for sleeping. For many, it’s preferred to a sleeping bag in a hammock for a few reasons. For one, sleeping bags can feel claustrophobic in a hammock, especially if you’re in a double with two people. Plus, in a hammock the sleeping bag compresses, which reduces its insulation. Thinking about giving hammock camping a shot? Give any one of these hammocks a try. We poured over hundreds of options, and these are hands-down the best camping hammocks on the market. Whether you’re going for a quick overnight, or you’re hiking the Appalachian, there are options here that will serve your needs. Think we missed a great hammock? Let us know. 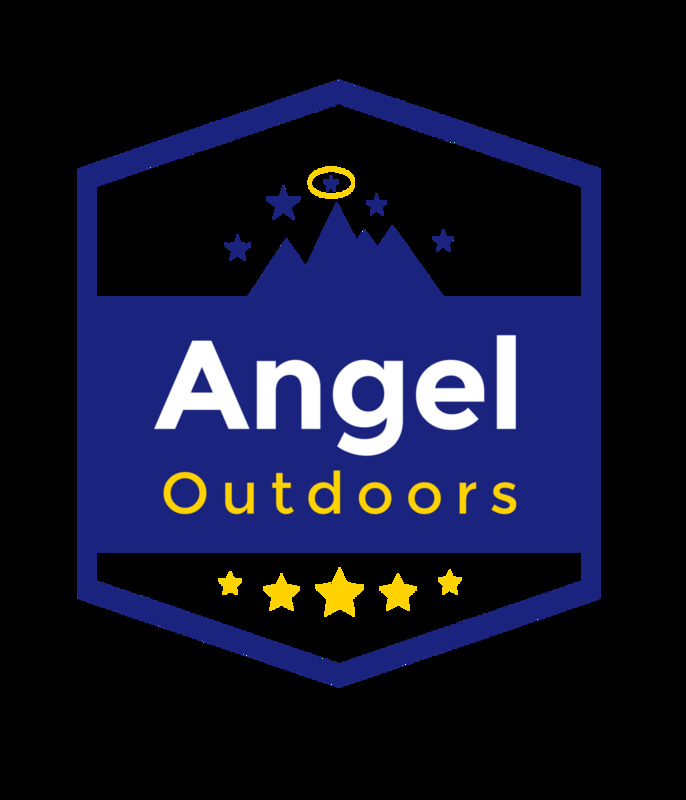 Connect with Angel Outdoors on Facebook or Instagram and tell us about your favorite backpacking hammocks. Get Your Best Hammock Guide, Free! We will send you the best guide to help you with your outdoor experience!